psychoactive drugs. A great way to donate without lots of fees. Contribute a bit today! 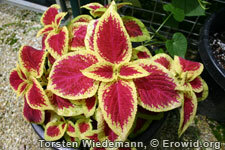 Coleus is an annual herb grown for its brilliant foliage. It has been used by the Mazatec indians of Oaxaca as a replacement for S. divinorum, though little is known about its effects or active chemicals. Content & design © 1995-2018 Erowid.org. Permission required before publicly reproducing Erowid info.